Last Friday Steven and I visited my favorite place in Seattle, Pike Place Market. We don't go there very often so I took the opportunity to splurge on all kinds of goodies. First we hit up World Spice Merchants, which is in my opinion Seattle's best spice house. If you live in the area and haven't been there you really owe it to yourself to go. They ground my allspice when I ordered it so it was as fresh as can be. Who knows how long that preground allspice has been sitting on that supermarket shelf? Next we perused the produce stands where I splurged on one, yes just one, blood orange. Along the way we tried some 25 year aged balsamic vinegar and some fig balsamic (both of which were simply amazing). We sampled some artisan chocolate pasta that you could eat dry and uncooked. Then off to the butcher for veal shanks ($12.90 a pound, ouch). Finally to the fishmonger, where the selection of seafood is just overwhelming: scallops the size of your palm, crimson fillets of king salmon, and fresh wild-caught halibut cheeks. At $16.99 a pound, there was definitely some hesitation, but I thought what the heck, it's still cheaper than dining out, so I got half a pound. For the Chinese, the cheek is the most coveted part of the fish, prized for its sweet flavor and tenderness. Chopsticks gently pry this delicacy out from the cavity below the eyes and it is then offered to the guest of honor. The cheek of a typical steamed fish is a tiny morsel about the size of a raisin. However, the ginormous halibut will yield a behemoth of a cheek that are almost the size of a deck of playing cards. Eating a plate of only fish cheeks? It sounds too good to be true, almost wrong... yet so right. I wanted to showcase the fish cheeks amazing flavor and texture so it required very little dressing up. This beautiful piece of fish requires no fancy sauce, just a little salt and pepper.The buttery taste of yukon golds pairs perfectly with the buttery fish. (I think the best mashed potatoes are made with yukon golds, russets are too bland and boring). 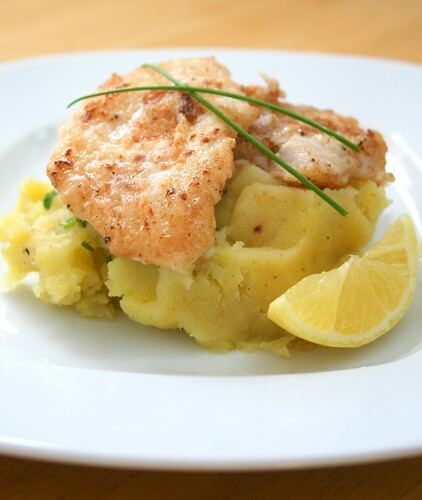 The potatoes are topped with a little chive oil for the tiniest oniony kick and finally, a squeeze of lemon juice on the cheeks provides the perfect acidic note to counter the richness of the fish and potatoes. Oh and what did Steven say? "Hey guess what?" "We're eating haliBUTTCHEEKS. lol." First make the chive oil, finely mince the chives and mix with olive oil and set aside to infuse. Scrub the potatoes and dig out any emerging roots. Leave the potatoes whole and place them in a saucepan and fill with about half an inch of water. Simmer until they can be easily pierced with a knife, about 15 - 25 minutes depending on the size of your potatoes. Leave the heat on. After all the potatoes are tender (smaller potatoes will require less time than the larger potatoes), peel the potatoes, then put them through a potato ricer, a food mill using the coarse disc, or mash with a potato masher. A ricer or food mill will produce the fluffiest potatoes. Rice the potatoes back into or mash them directly in the hot pot back on heat for a minute to dry out the potatoes. Then using a rubber spatula, fold in 3 tablespoons of butter and season with salt and pepper (optional ingredient: add some lemon zest for lemon scented potatoes). Keep warm until serving. Season the cheeks with a little salt and pepper then dredge them in flour, shaking off the excess. The cheeks cook very quickly, like scallops, and will only take about minute or two per side. Heat 1 tablespoon of butter in a nonstick skillet over medium heat heat. When the foaming stops, add the cheeks and cook until the first side is golden brown, 1 - 2 minutes. Flip over and cook the second side until golden brown, 1 - 2 minutes. Place a mound of mashed potatoes on the plate, spoon some chive oil on top, and place the cheeks ontop of the mashed potatoes and squeeze some lemon juice on top. Serve immediately. Wow, those are some big cheeks!$16.99 a pound for card deck size buttery goodness... it totally looks worth it. Delicious! You are so lucky to have the wonderful markets nearby. I can't remember seeing halibut cheeks at any of our local fish markets, except at the Asian supermarket. Your recipe looks lovely, and totally worth the cost. This dish looks delicious, Amy, I love fish! And that balsamic vinegar sounds interesting, too! That looks so incredibly yummy! I wish we had a place like Pike here in Richmond, VA.
Whoa. Still, I don't know if I could spend $16.99 a pound. Yours looks gorgeous though. Amy, those look soooo good! I have heard a lot about the "cheek" of the fish, but I've never seen any around here. Are they ever called something else, or am I just SOL? That looks good. Nice and simple and tasty. I just tried halibut and really enjoyed it. omg my brother told me about this and i was like halibut cheeks...how big? WHAT? OMG I WANT!! hehehe. Peabody - OMG we LOVE those little donuts. Ah the cinnamon sugar, the grease stained paper bag... mmm! But the stand was closed when we went. :( *sigh* was so sad. Patricia - The balsamic was sooo sweet and thick, only slightly acidic. It was delish. Veron - Thanks! I adore Pike Place! Kevin - The halibut cheek is especially delish. I bet you'll love it. Cooking - Thanks for visiting! Bettina - Too bad you didn't stay longer for spring break. Next time you're in town we'll get some more. I am not a big fish eater, but this dish had me have second thoughts - light and yummee. OMGoodness Amy, you killed a part of me when you described how the fish cheek is the best part of the fish. Your words are better than honey! Amy, I am so psyched! I stopped in at my fish market looking for flounder and they had GROUPER CHEEKS!!! I've never, ever seen them there before. I bought all they had and I'm making them tonight. If they turn out good, I'll post about them. I can't wait! YUM! I adore halibut cheeks! This looks delish. Thanks for the inspiration.